Mia, 19, is from Denmark and on 27th August 2013, she joined her host family in London. She wanted to share with us the experience of her first two weeks with her host family as she has had such a great time and found them to be particularly welcoming. “On the 27th of August I went on the plain to London, it was my first time alone on a plane, so I was quit nervous. My mom drove me to the airport, where she said goodbye, we hugged and I cried a little. It was a weird feeling to say goodbye, but at the same time I new that my stay in London would be a really good adventure! 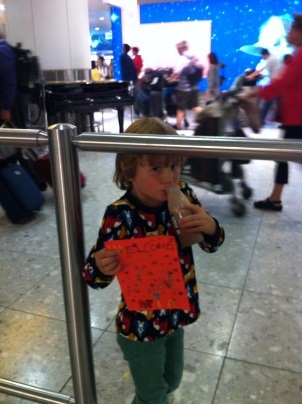 My host mom and her child, Aiden who is almost 5 years old, were waiting for me at Heathrow Airport in London, they had brought me flowers and Aiden had made me a ‘’welcome card’’ with glitter for me. Really sweet of him. When we got to the car I went to the right side, but then my host mom asked me if I wanted to drive, and then I looked into the car and saw that I was standing at the drivers side. I laughed and said no! I quickly went to the left side instead. It is so weird that everything is opposite when it comes to the traffic, but you get used to it very quickly. When we got to the house in Brixton, we got some champagne, Aiden got children´s champagne, to celebrate me coming to London. We sat down at the kitchen table and got something to eat, we talked and it was really nice. It was a bit late and Aiden had to go to sleep, so I gave them my presents, I had brought from Denmark, before he went to bed. My host mom got Medusa cupcakes (danish design) and Aiden got playmobile pirates. They loved their presents and we had so much fun playing with it, Aiden almost started crying that is how much he laughed. The next day My host mom and Aiden took me around Brixton, so I could see how it was. I saw all the nice stores, the Brixton Village with a lot of really nice food and and restaurants. We also sat down to get a bite of food and later we got Italian ice cream. I also got to see the cinema and the library, where we went to read some books. Aiden really likes the library and he didn’t want to leave, so his mom allowed him to take out some books. Later when Aiden was at his dad’s house, the girls from across the street knocked on our door and they gave us some birthday cake. Really nice of them! Me and my host mom then went to make coffee and hot chocolate. Afterwards I went to unpack my stuff. Thursday was my first day alone with Aiden, it was really fun, we played a lot of board games, read a lot of books and played with his new pirates. He is so easy, and I’m so glad that I don’t have big problems with him. We also read a Planes magazine, because at 14.00 we were going to the cinema to see Planes. My host mom met us there, and it was a really nice activity to do together and I love going to the cinema. On my first Friday my host mom had a party for me, where she invited the neighbours and some of her friends. It was really nice to meet all these new people, I also got to meet one of my host mom’s friend’s au pair, which was really nice. 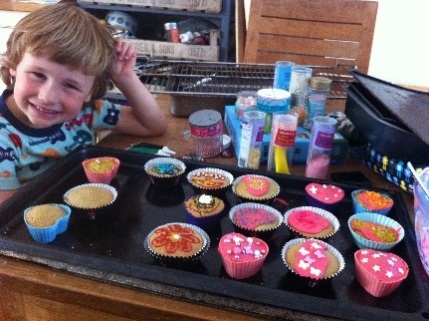 Me and Aiden had made cupcakes for the party, it was really fun, and he loves to help in the kitchen. We had a really good time decorating them. Saturday Aiden was at his dad’s house, so me and my host mom went to the Brockwell Park to play rounders with some of her friends (The park is also the perfect place to go for a run). It was so much fun, everybody was so sweet. It was so lovely to get out and see the park, and to play around with a group of grown-ups! We made two teams, Team Lohan and Team Britney. I was on Team Lohan and we won! After the game we went home to the people who planned it all, we got something to drink, eat and I got to taste Pimm’s, which is a popular drink in the UK. Afterwards me and my host mom went to see Siro-A, which is a group of six performers, who dance and mime with a lot of really cool video, light and sound effects. After that my host mom showed me China Town and The Ritz. Tuesday was Aiden’s first day at school. He looks so cute in his uniform. His school is only 5 min. away, so it is really easy to follow him to it. Tuesday was a really hot day, so when Aiden got home, we had a water fight, everyone got really wet, but it was so much fun. Wednesday I joined the gym, it is a really good gym and it has a swimming pool! At the evening we went to a Portuguese restaurant with my host mom’s parents, they are really sweet, and her father is so funny. Thursday we went to a park after school with a really nice playground. My host mom invited a mom and her three kids back to our house for a playdate. (Her middle child is in the same class as Aiden). The two girls from across the street came over as well. While Aiden had been at school I had filled up his swimming pool, so all the kids just went in it. All the kids splashed water at me, it was so much fun and a really good day. In the evening I went to football practice for the first time, I had been searching online for a club I could play in, so I could keep playing football. I met some really nice girls from the area, they were all very welcoming and friendly. Sometimes after practice they go to a bar for a drink, so I think it is a really good way to meet people and to get out and experience new stuff. On my second weekend me and my host mom went to Bray near Maidenhead to visit a friend of hers. We went out for dinner at the Heston Blumenthal’s place, where we got some really delicious food, a couple of good drinks and afterwards I went clubbing with his daughter and her friend. We had such a good time, and it was fun to see how they do it in the UK. It’s a little bit annoying that the clubs close earlier than what I’m used to in Denmark, but luckily we had a blast anyway. I have no problems with my host-family, the kid is so easy and it is very rare he gets mad or starts crying. For the most it’s when he has lost a game against his mom! I’m already starting to feel like a part of the family, and I’m so glad that I haven’t felt homesick yet. Of course I miss them all back in Denmark and sometimes I feel like I’m missing out on stuff, but I already know that this year will be so special and I will get so many new experiences, which I wouldn’t get back home. I have already made a lot of plans with other au pairs, and I can’t wait to see more of London and go on new adventures with them.